That's what Jesse Bethel High School senior Samantha Mercado attributes to how she became this year's valedictorian. "It really helped me with my work ethic," said Mercado, an 18-year-old who hopes to one day be commissioned as a Navy officer. Mercado, whose father retired from the Navy, joined the Navy ROTC at Bethel, which had been moved this year from Hogan High School due to that school's impending closure. "I'm interested in political science ... and the military would be a good opportunity to explore all that," Mercado said. Mercado plans to join the ROTC program at the University of California, Berkeley, where she will major in political science. When Mercado first walked onto Bethel's campus as a freshman four years ago, she had no idea she would one day become its valedictorian. "I never really planned (to become valedictorian). 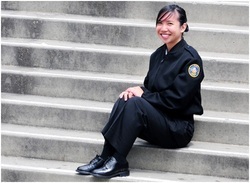 I just kept on doing what I did," said Mercado, dressed in her ROTC uniform last month in Bethel's quad. Despite Mercado's focus on academics -- she came in during spring break for extra calculus tutoring -- she is also a talented musician. "I really like music, and I like the element of performing in front of people," said Mercado, who plays the flute and the saxophone in band. As Mercado nears the end of her high school career, she said she'll miss her friends and the band. What she'll remember the most is this year's grad night, when students took a tour of Southern California's theme parks. Mercado said the key to success is to focus on your passions. "Take classes that you are interested in and always pursue what you love," Mercado said. Bethel's class of 2011 graduates Thursday.